Amerithon Challenge Completed! And some thoughts on goals. Today, May 5, I completed my biggest target yet in terms of mileage. 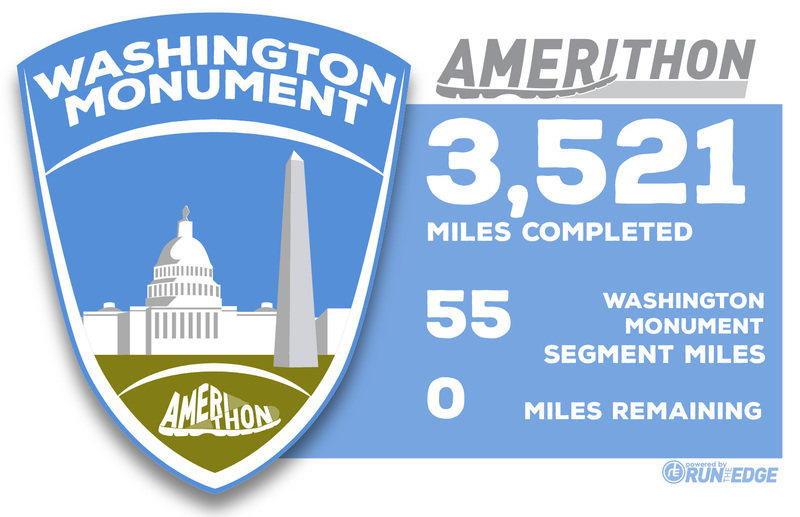 Run The Edge has been offering up the Amerithon Challenge - 3,521 virtual miles from San Francisco to Washington DC. 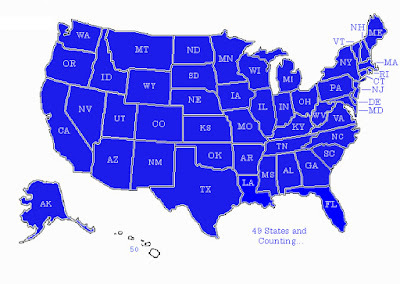 While taking on their 2,016 miles in 2016 challenge last year, I received word to this additional quest and signed up. The Amerithon Challenge includes all forms of movement, so I counted runs, bike rides, swims and hikes (the latter two accounting for very few of the total miles). It works by running, riding, etc wherever you are in the world. You then go onto the update page and tap in your results for the day. This is an honor system. I chose to not link to my Garmin or Strava accounts due to bugs with the system early on. Instead, I have a spreadsheet that pulls that data and gives me lots of stats and info. With 10 miles today (8 riding, 2 running), I passed 3,521 and virtually sped to the foot of the obelisk honoring our first president. The challenge commenced on July 4, 2016, so 10 months and 1 day elapsed before I finished. I started this crazy tracking of miles with 5 coworkers from Oculus. As a team, we hit the goal back in late November. While I counted for 40% of those miles, this was really a team effort and we daily pushed each other along. I decided to continue on my own to keep that momentum going. This leads me to write a bit about running/exercising goals. As a very goal oriented person - I think dopamine fires off in my brain whenever I complete any task - these make total sense. If you look back at my posts last July (here, here, here, here and here), I set out a number goals for my 49th birthday, 2016 overall and part of 2017. I'll update those below. The good part of goals is that they motivate you. Those achy or rainy days cannot keep you inside. Every run, ride, swim, whatever counts to some outcome or another. There are almost no "bad" days when you wish you had just binge watched Netflix instead of pounding the pavement. Every life coach and motivational guru will tell you when you have goals, life gets better. Many of these people attribute this to a study done on the 1953 graduating Yale University class. Some 3% of these seniors had written down life goals. When they were queried later in life, those 3% had significantly out earned their goalless classmates. Goal setters 1, undecideds 0. All good. Everyone reading this go write down some life goals! No evidence has found that this purported survey and study ever occurred. None. Zero. Zippo. No Eli graduate admits to being asked anything about goals at the time. In fact, some "sources" attribute this study to the Harvard '53ers. Yale even has a page on their library website given how often pings land on their desk asking for the raw data. (http://ask.library.yale.edu/faq/175224). The verdict: The "goal study" belongs with other urban myths. But who cares if the study happened or not. We all know goals are good for us. Right? Goals force people to narrow their focus. The goal takes over everything else. Short term thinking reduces long term strategy and the ability to react to changes. People who are missing goals are more likely to make unethical decisions and even lie about completion (Enron, Wells Fargo and other companies provide numerous case studies of this). In organizations, competition can be overemphasized despite often needing to favor collaborative behavior for real success. Even worse, missing goals can have terrible ramifications on people's brains. Disappointment can lead to a lack of confidence and a lack of motivation for future choices. This can create a downward spiral of retrograde motion so that the end point is actually backwards from the starting state at the time of picking goals. Why do so many people set New Years resolutions but rarely expect them to last beyond February? In a running or exercising scenario, goals could lead to working out when you are physically unable or pushing too hard leading to blowing out a knee or some other part of the body. I certainly have been guilty, but fortunately not seriously punished, for pushing too hard. I remember deciding at the last minute to get just one more marathon done and then sitting sick for a week. Running mentors always advise against "junk miles" when you add just more mileage to a hard workout instead of stopping and resting. The extra miles are usually performed in worse form, another reason for injury. One of the keys is to make and complete goals is to focus on process rather than on results. For example, in my 50 state goal, the action for that goal was to run 10-12 marathons per year. What's the difference? First, there are smaller wins possible (annual goals). Goal experts recommend this type of approach. Smaller wins are more rewarding and lock in success along the way rather than needing to get all the way to the finish line. Second, there is an implied consistency to this way of approaching goals. Goals that are based on process are far safer than goals based on outcomes. For instance, the goal "I want to get fit" is not helpful. It's too vague and subject to definition slips. Even, "I want to lose 10 lbs" is not wonderful. You can lose 10 lbs by skipping a bunch of meals. In fact, that's even more risky since losing weight too fast is bad for the body and unlikely to be kept off the waist. The best goal is something similar to: "I want to eat healthy at least 6 days a week and to work out 3 days per week." Short term success and long term behavior improvements lead to true results. (Examples adapted and expanded from iwillteachyoutoberich.com.) 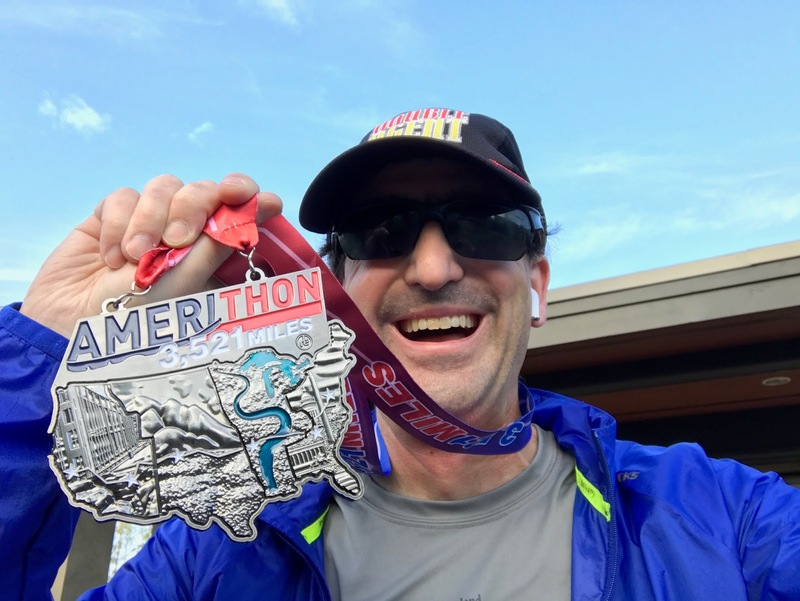 For me, I kept myself from running a marathon every weekend even if it had led to finishing my 50 state goal sooner than now. More than likely I would have gotten serious injured if I had pushed harder. Part of the reason I have a run and a cycle goal is to keep me cross-training. More specifically, I have some big mileage goals, but really behind the scenes, I have consistency goals. I want to actually hit my goals on schedule - not massively ahead of them. This keeps me from just going nuts with tons of 10 mile+ days. I also set monthly goals. For example, during this month of May 2017, I want to average 8 running miles per day and climb 3500 meters over the 31 days. However, I have no speed goal. I'm fine to do this slowly or quickly depending on how I feel. Since this will give me 20-30 miles extra to my overall 2017 year goal, I plan to keep December to closer to 6.5 miles per day. I'm pushing myself in May with its good weather and long days as a trade against a chilly dark December. And for me, the goal is really to just stay healthy and have fun. Sure, I have a target time when I run a marathon, and even a back-up time. But behind that is a simple one: Just finish and be healthy. What's right for you? Maybe it's just getting a walk no matter the distance? Maybe it's completing the Amerithon Challenge like I did? Or maybe it's some combination of behavior changes like eating well, getting great sleep and healthy doses of exercise. Whichever the answer, I wish you success in adopting new behaviors that lead to your intelligently chosen goals.